Markets were again struck by fear selling and media were coming up with tons of reasons why. At first, it was tech stocks such as AAPL driving the markets down, then semiconductors, later oil… all in one day. You could play the miney, miny… game to pick the reason. Granted, they do it all to entertain. However, the selling appeared to be purely technical, as I will present in this article, and quite predictable. 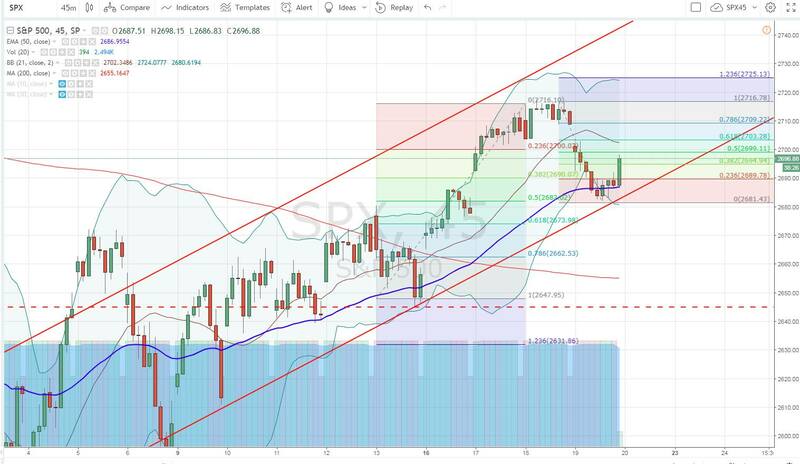 Not that I predict the markets, I still have expectations but I do not trade to fulfill those predictions but use them to help me navigate the trade. Overall, I am still bullish in this market, although my convictions is getting slimmer seeing how weak the bulls are. Look at it this way, media were all in excited expectations of earnings season pushing this market higher. So far, it is not happening. And that may be a problem for bulls short term. This market behavior is making me reconsidering my trading strategy and taking longer term trades to be able to go far away from the money and still collect a decent premium at least as far as trading SPX index goes. 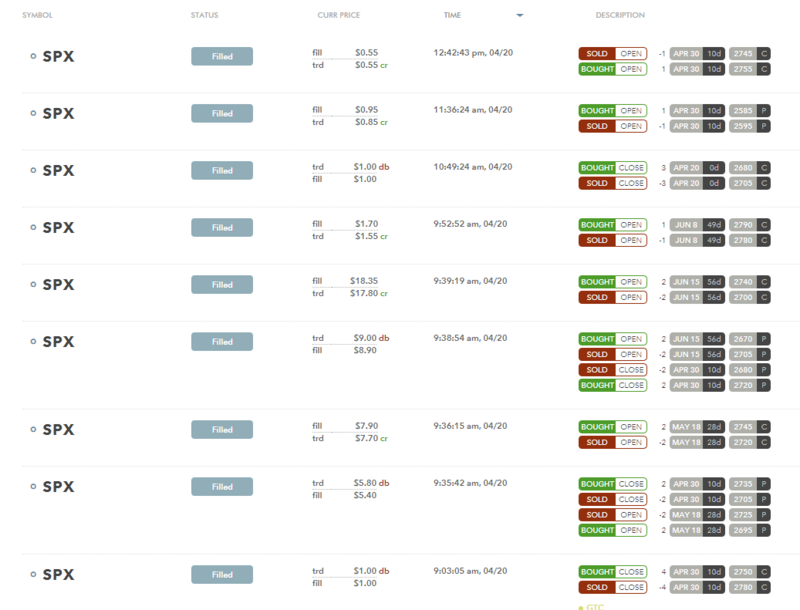 This volatility is going to stay and I want my positions to be market noise. Looking at the chart, trading 1 or 2 DTE SPX index is not giving me that option to stay far away and collect a decent premium. I want my trades safe which I do not have to watch every day glued on my monitor. 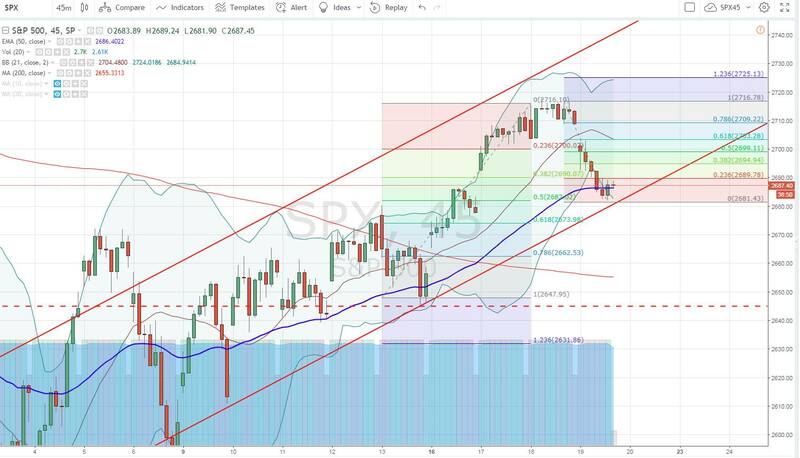 Fair enough that I have to watch those trades, which are at expiration day, too close to the money and you are facing a question – what to do with it. I had an expiring bull put spread on SPX index: 2685 / 2660. 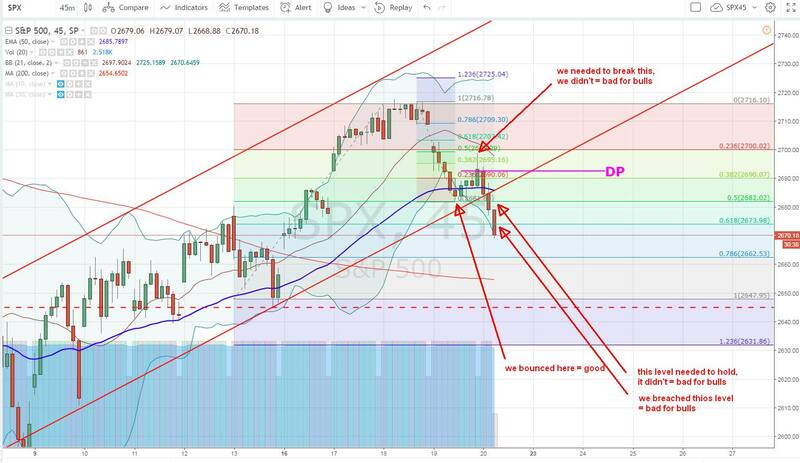 If you are a member of our SPX trading group you could follow my thoughts which i decided to publish and give an insight of what the market might have done and how I would react. On Thursday, the previous day, the markets went on a selling spree. It started being obvious that we might have gone down to 2675 from previous 2716 level. It was great, but it also told me that my trade may actually be in trouble. For the day, it was safe. The market spiked up and went away from my strikes. I had a trade at 2685 and the market went to 2699. so why troubles? 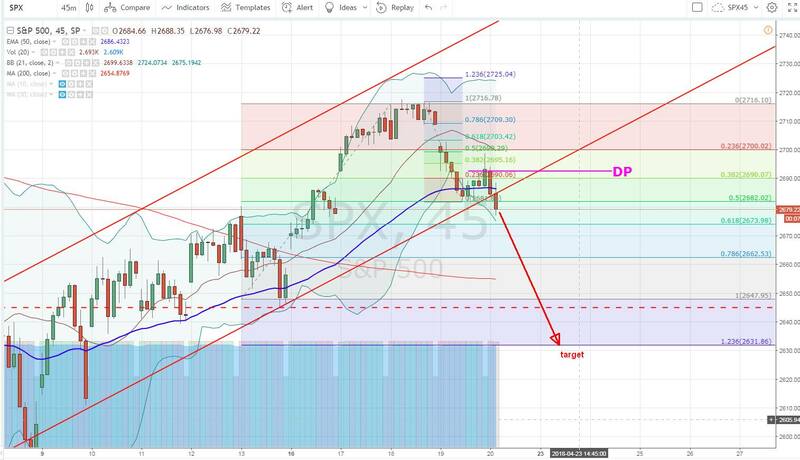 The 2700 was a 50% retracement of a down trend. In order for the retracement to fail, we needed it to be breached. And by going to 2699 only, then returning back down, it became obvious that the downtrend will continue. I only hoped, that on Friday (yesterday) the market will have enough strength to go higher, test the level, and breach it. 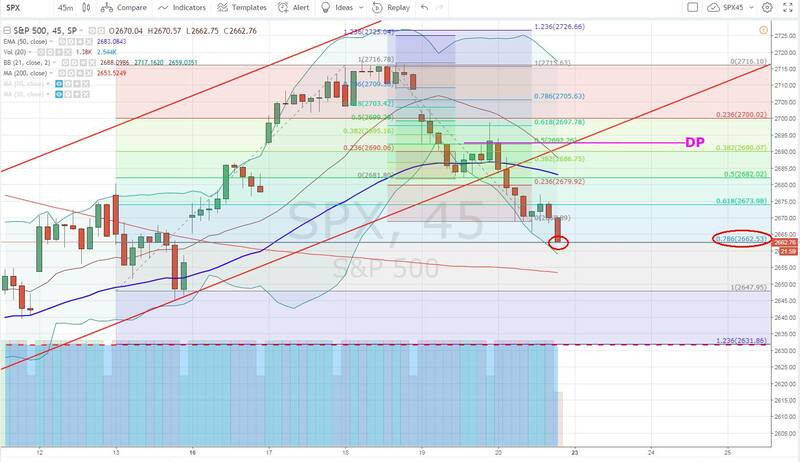 There were two conflicting levels – the upward 50% retracement at 2682 and a downward 50% retracement at 2699 and we were stuck in between. Which will prevail and which direction would the index take? I had no answer to that. But given the weakness I felt like the downward move would be the winner. Yet, I wasn’t sure. So I decided to roll my 2685/2660 put spread lower to 2680 / 2655. If the market kept trading sideways here, I would be safe, and if it spiked up again, I would be a winner. 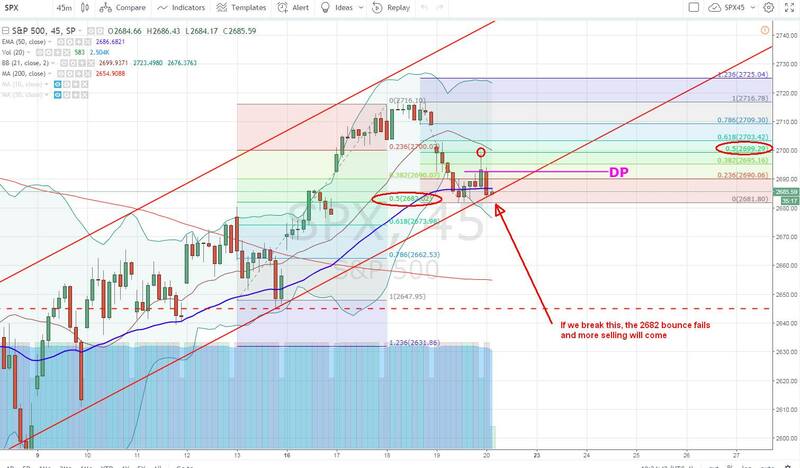 I still believed at that moment, that the re-test of 2699 the previous day was not the right re-test I have expected and I hoped that Friday would be the day when we would go up again, re-test the 50% retracement level at 2700 and breach it, which would mean resuming the uptrend. Soon after, my call spread was bought back for 1.00 debit leaving me with about $1,900 profit on this entire trade (with all credit/debit adjustments included). Before the end of the trading day, we reached the first target I saw coming. Unfortunately, this seems like we will be heading lower on Monday to clear the main target of 2630 I indicated before. 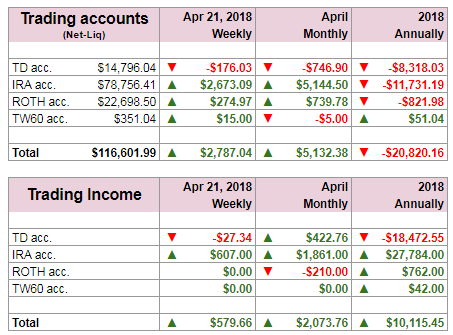 Even though the markets tumbled, this was a successful week. However, I am still going to continue in raising cash, reducing exposure, minimizing opening new trades unless a really good opportunity opens. Mostly, I will be opening a very wide trades which would bring premiums although small, but safe and sure to not get touched by the volatile market. I will keep accumulating my dividend stock positions. As the market tanked, we reversed our SPX put spreads to call spreads, rolled longer term away and down offsetting them with calls. Opening a few longer term put spreads which we may reverse if this market turns into a bear (I still do not expect it but the conviction is getting smaller). 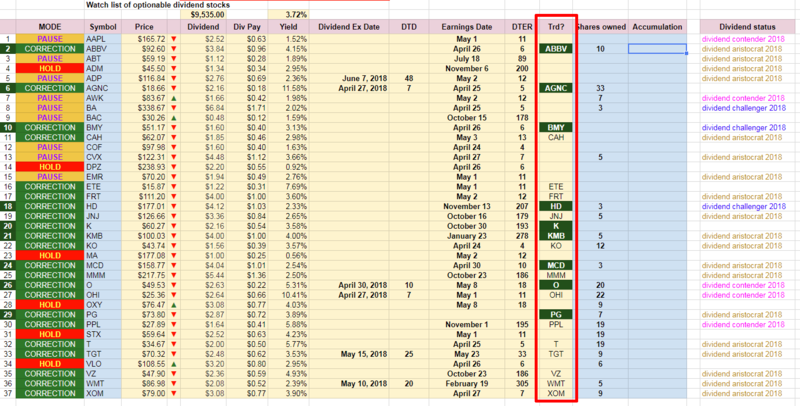 Another great dividend aristocrat popped out today as undervalued – Kellogg’s (K). I will be reviewing the stock over the weekend and may buy in on Monday!